A remote archipelago in the South China Sea has come under an extraordinary amount of scrutiny lately. Here, China is building up small reefs and atolls into whole artificial islands—all in hotly disputed territory. In the clearest sign yet of its military intentions, one of those islands now has an airstrip. 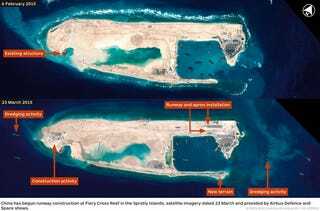 Satellite images taken on March 23 and first published by IHS Jane show the evolution of Fiery Cross Reef, one of the many blips that make up the Spratly Islands. Just a few months ago, Fiery Cross Reef was, true to its name, a submerged reef just barely poking above the water. Since then, dredging has turned it into an artificial island. It now has a harbor and and a runway in progress. The 10,000-foot runway would be long enough for fighter jets and spy planes, according to the New York Times, which calls it a “game changer.” Once China has air control of the South China Sea, it’ll have a lot more power in the region.